3G3RV SERIES, ADVANCED TYPE ! Simple and versatile features, small size and economy. Maintenance is simpler. 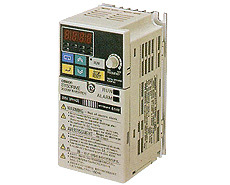 Make variable speed operation easier. . . What can make this wish come true is the small inverter 3G3JV series. Focus on superior performance and superior functionality in a compact body. The front adjustment knob is easy to operate and changes speed. Easy to install, easy to operate, and versatile. Effective control of the motor is achieved. Speed ​​adjustment can be easily achieved with the front adjustment knob. Once the power is turned on, it can be operated immediately. Features, etc., contain a variety of convenient features. The cooling fan can be detached with a single push, and it can only be put into operation during operation, which can extend the life. The space-saving compact size makes it easier to install inside the disc. Since the main circuit terminals are arranged up and down, the connection can be made lightly. At the same time, through the use of the DIN rail, it can be installed/detached with one push. Corresponding to 0~10V, 4~20mA, 0~20mA analog output, multi-function output terminal, analog monitoring, etc. PNP/NPN input switching can be realized on the multi-function input, and higher degrees of freedom can be achieved. Meets CE specifications and UL/cUL specifications. The soft start and soft brake prevent the goods from falling and falling. The multi-speed function of the maximum 9-speed speed enables the conveyor belt speed to be adjusted in multiple stages. It can be used for variable speed adjustment of small mixers, separators, etc. The most suitable air volume can be controlled according to the indoor temperature. No contact change is safer and more reliable than the ON/OFF control of the contactor. At the same time, the most suitable air volume adjustment to achieve energy savings. The multi-speed operation function makes the switch safer and more efficient. The high-speed operation at the time of ascent makes the opening more rapid. When the vehicle is lowered, the safety condition is confirmed to be at the middle speed, and when it is lowered to the fast closing position, the operation is started at a low speed to reduce the occurrence of an accident. Advantages︰ Simple and versatile features, small size and economy. Maintenance is simpler.